Fritattas are very versatile, as you can add lots of different things. They are also a good way of making a meal in only one pan, so less washing up! 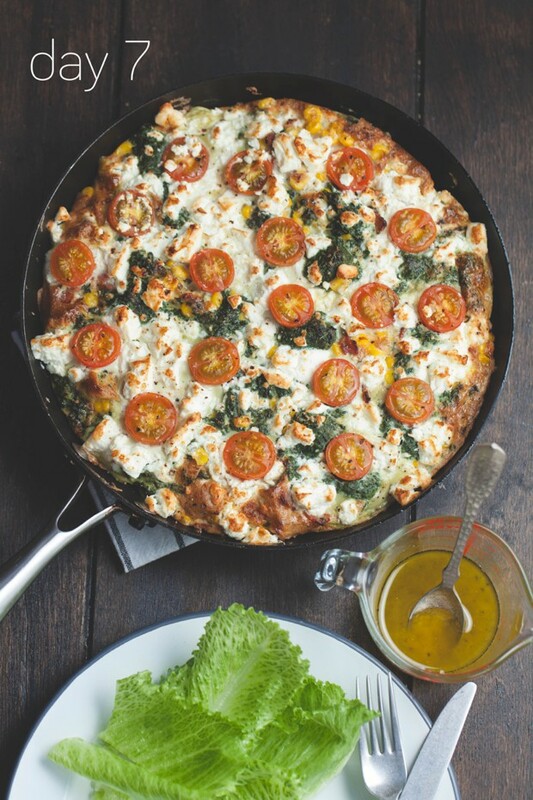 Day 7, we had to go out with a bang, so here it is, our Spinach and Feta Frittata recipe from our book NOSH FOR STUDENTS! Make the salad dressing and prepare the salad. Heat a little oil in a frying pan and fry the lardons until they begin to brown. Add the sweetcorn and spinach to the pan and cook for 1 minute. Put the grill on to preheat. Beat the eggs and pour into the pan. Cook. As the egg begins to set, gently move so the unset egg reaches the bottom of the pan. While some of the egg is still runny, add the feta and tomatoes. Do not stir after this point. Place the pan under the grill and cook until the egg is set and the top begins to brown. Should take between 5–10 minutes.